Are you ever curious to know how people classify on Planet Four? Well today is your day. I’m working on generating the final numbers for the first half of the Planet Four science paper in preparation. The paper is an introduction to the project and will contain the catalog of blotches and fans identified thanks to your help in Season 2 and Season 3. We’re getting closer to having the paper and the final catalog preparation in shape for submission by the end of the summer. As part of the paper, I wrote the section that talks about the classification rate and how people classify on the site. So I made a few close-to-final plots and calculated some relevant numbers from the classification database for Season 2 and 3 that will be included in the paper so I thought I’d share them here. These values and figures below are pretty close what will be in the submitted science paper. We had a total of 3,517,363 classifications for Seasons 2 and 3 combined. More blotches than fans were drawn, 3,483,724 blotches compared to 2,825,930 fans. With a total of 84604 unique ip addresses and registered volunteers who contributed to Planet Four when Season 2 and Season 3 titles were in rotation. Most classifiers don’t log in. There is no difference between the non-logged in and and logged-in experience on Planet Four other than that if you classify with your Zooniverse account we can then give you credit for your contributions in the acknowledgement website we’ll make for the first paper, and we can only get your name (if you allow the Zooniverse to print it to acknowledge your effort) if you classify with a Zooniverse account. First plot shows the distribution of the classifications for each tile in Season 2 and Season 3. You can see the impact of BBC Stargazing. Most of our classifications for Season 2 and Season 3 came from the period during and the few months after BBC Stargazing live and the site was getting lots of classifications and attention so we retired titles after more classifications than now. Currently a tile needs 30 classifications before we retire it, a number that better suits our current classification rate. You can see that nearly all of the Season 2 and Season 3 have 30 classifications or more, with a range of total classifications that we have to take into account when doing the data analysis and identifying the final set of blotches and fans from your markings since some tiles will have significantly more people looking at it than others. 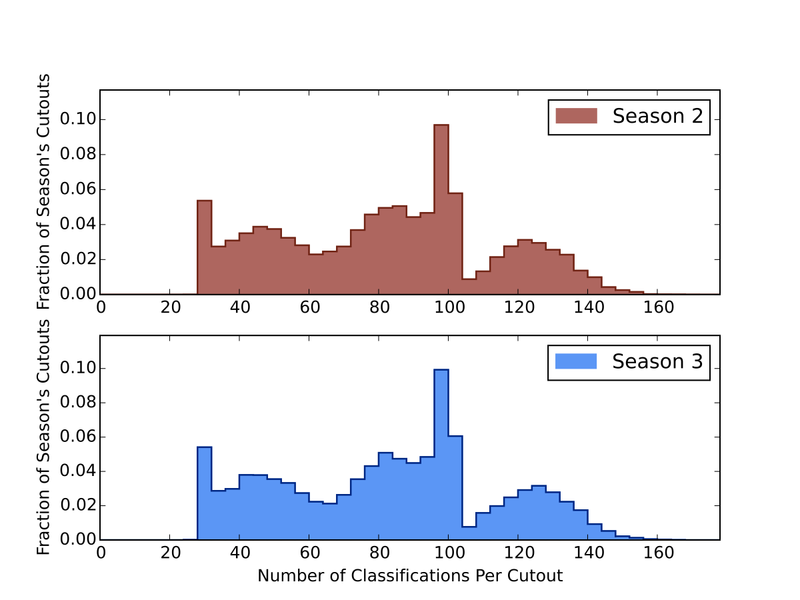 The next plot shows the distributions of classifications for logged-in and non-logged in (without a Zooniverse account) classifiers combined for Season 2 and Season 3. 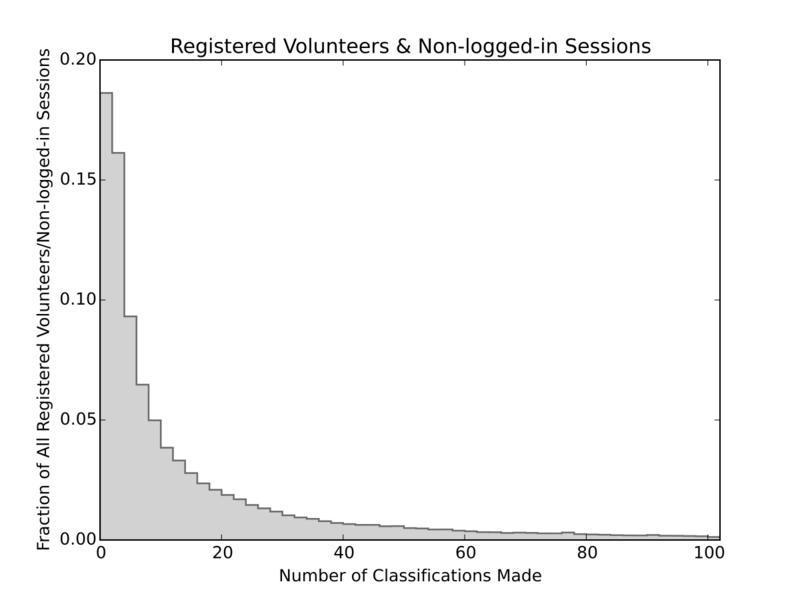 We have a way to track roughly the number of classifications a non-logged in session does so I count them as a separate ‘volunteer’ in this plot (note I cut the plot off at 100 classifications for visibility). You can see that most people only do a few classifications and leave and there is a distribution and a tail of volunteers who do more work. That’s typical of the participation in most websites on the Internet About 80% of our classifications come from people who do more than 50 classifications, typical of many Zooniverse projects. Both the people that contribute a few clicks and those that contribute more are valuable to the project and help us identify the seasonal features on Mars. So thanks for any and all classifications you made towards Season 2 and Season 3, and if you have a moment to spare today there’s many more images waiting to be classified at http://www.planetfour.org.